In the aftermath of the EU referendum many UK-based Europeans have been left with feelings of insecurity and anxiety about what the future might hold for them and their families. ‘At Home’ shares their thoughts and experiences following this momentous and potentially life-changing political decision. The project combines intimate portraits and first hand testimonies gathered through a series of interviews and photography sessions over 2016 and 2017. Simona, a cellist from Italy, in her kitchen in the flat she shares with her husband. Leeds, 2016. «I cried when I found out about the result of the referendum, for me it was a sign of regression more than progression. I think the idea of controlling people’s movement between countries is quite unnatural and unnecessary. Sometimes we forget how much we are all part of the same land and I actually do really admire people who are brave enough to start a new live in a different cultural surrounding. I love the idea of multiculturalism and having the diversity of many different communities. I don’t think Brexit will seriously threaten that. Even if life in the UK is going to be slightly more difficult for Europeans from now on, multiculturalism is still too strong for Brexit to actually stop it or harm it in a serious way. I have friends who supported Leave and their reasons were more financial than related to immigration. They are hoping for a beneficial change to come from Brexit and, even though I personally can’t see the advantages of such a choice, that doesn’t mean there aren’t any. Simona moved to the UK from Italy in 2009. She holds a Diploma in Business and International Studies, however, after taking cello lessons in her hometown she realised that her true calling was pursuing a career in music. In 2014 she received a scholarship to purchase a new musical instrument and enrolled to study a BA in Music Performance in one of the country's leading conservatoires. After completing her studies, Simona would like to carry on working in the music industry, either in a performing or teaching role. Interviewed on November 15th, 2016. Alexandra, a mental health professional from Greece, in the house she shares with her three children. Nottingham, October 2016. «Brexit shattered my illusions about the UK being a sort of Utopia. I left Greece because I realised it had a lot of work to do on women’s rights, gay rights, human rights, immigrant rights, etc. and I felt that the UK was a green and happy land where people were more open-minded and tolerant. I realise now that it wasn’t that they were more tolerant about immigration, I think there was indifference towards us rather than tolerance. 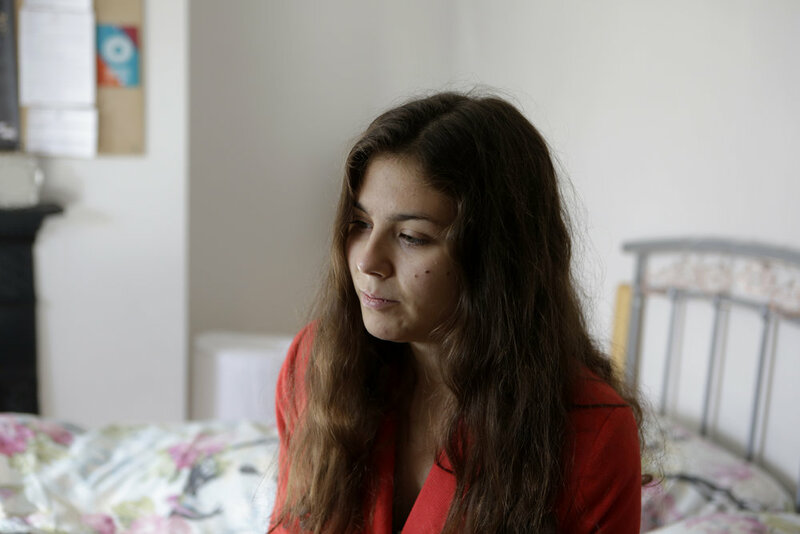 Alexandra came to the UK from Greece in 2003 to further her education. She then started a family and began working as a therapist for the NHS CAMS Service, supporting children with mental health issues. At the moment, Alexandra is focusing on her family. In the future, she hopes to be able to resume her studies in order to set up her own private practice as a Psychotherapist. Interviewed on October 9th, 2016. Alzbeta, a music student from Slovakia, in her shared accommodation. Leeds, October 2016. «I think some British people are not aware of what’s happening in the East or in other parts of Europe. They don’t understand what these people [Eastern European immigrants] are going through, why they move to this country and why they choose to stay here. For Slovakians it is mainly to do with our Government being corrupt. The middle class is diminishing, the lower class is getting bigger and you have 1% of the population owning pretty much everything. My own family has been affected by the situation. My mother has two Masters Degrees, she is a lawyer and an engineer, and she can’t find a job in my country. Alzbeta came to the UK in 2014 from Slovakia to pursue her passion for music. She started a BA in Music (Jazz), which she will complete in May 2017. Alzbeta came to the UK not knowing what to expect. Here she found a welcoming multicultural community and a thriving jazz music scene, where she regularly performs. She regards her decision to move to this country as the best decision she has made in her life. Interviewed on October 18th, 2016. Andres, a pharmacist from Spain, in the house he shares with his wife and young son. Nottingham, July 2016. 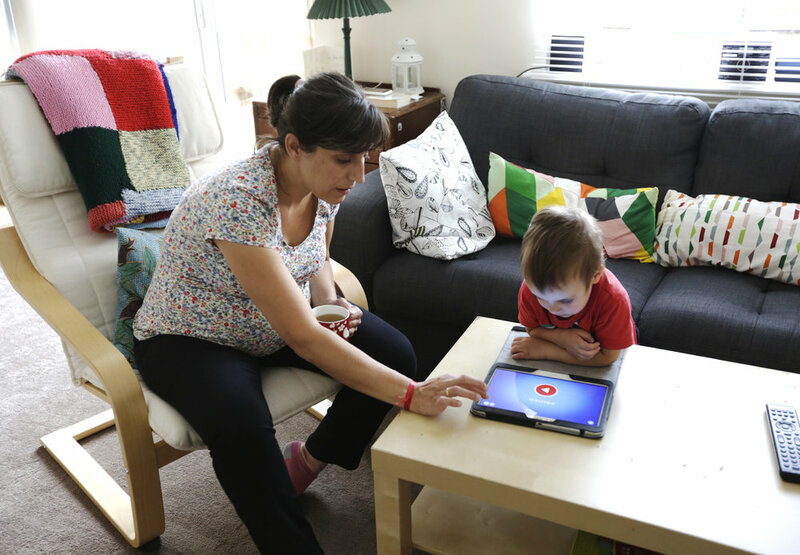 Inma, a Microbiologist from Spain, playing with her son Matias. Nottingham, July 2016. «After the referendum we experienced a mixture of emotions – fear, frustration, anger, a strong feeling of being unwanted. It was sad to see how most of the Leave campaign was focused on immigration, blaming people like us for some of the biggest problems of this country. We felt it was irresponsible of politicians to pit one section of the population against another for their own interests, not valuing foreign workers like us for the contribution we make to the development of this country. Inma and Andres come from Andalucía in Spain and have lived in the UK since 2011. They are married with a young son, who was born in England. Andres works as a pharmacist and has also set up "El Cuervo" - his own bilingual English-Spanish theatre company. Inma has worked as a researcher in Microbiology in the higher education sector and is now part of the scientific team of a British technology company. Inma and Andres decided to leave the UK and moved to Spain in 2018. 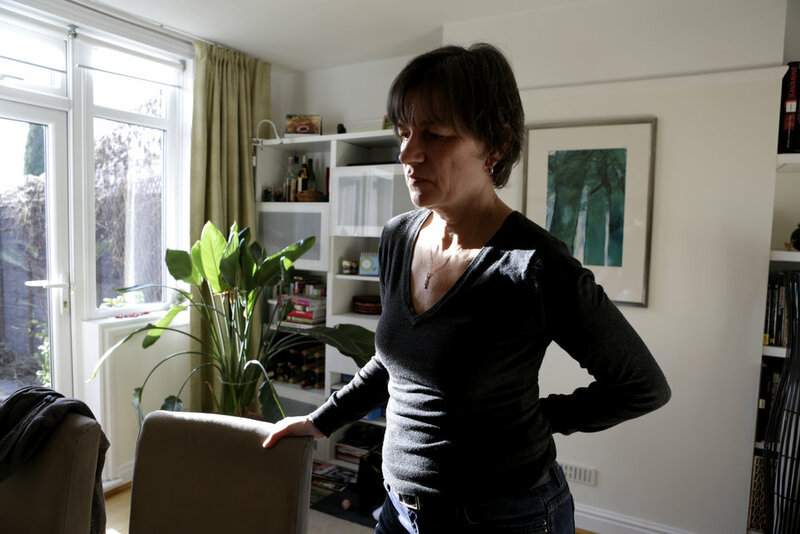 Anette, a freelance journalist from Germany, in her living room. Newark, 2017. «Brexit feels like a bad break-up and I still can’t understand why. I haven’t heard one single argument that convinces me that this is a good idea. Britain had very favourable terms. I think it all comes down to free movement, which personally I find insulting. We still don’t know any more than on the day after the referendum, it’s up and down all the time. The longer we face this uncertainty the more it is taking its toll on me mentally. I like to be in charge of my own destiny. But now I am dependent on other people’s decisions. No one listens to us, no one talks to us. All the papers are full with stories about us: who we apparently are, and what we apparently do, but no one is talking to us and showcasing our perspective. We are side-lined and we can only watch and wait and see what other people decide is going to happen with us. Anette comes from Germany and met her British partner while on holiday in Bali. She moved to the UK to be with him in 2011. She worked as a travel editor in Germany and she continued writing for German websites and magazines once in the UK. Interviewed on February 24th, 2017. 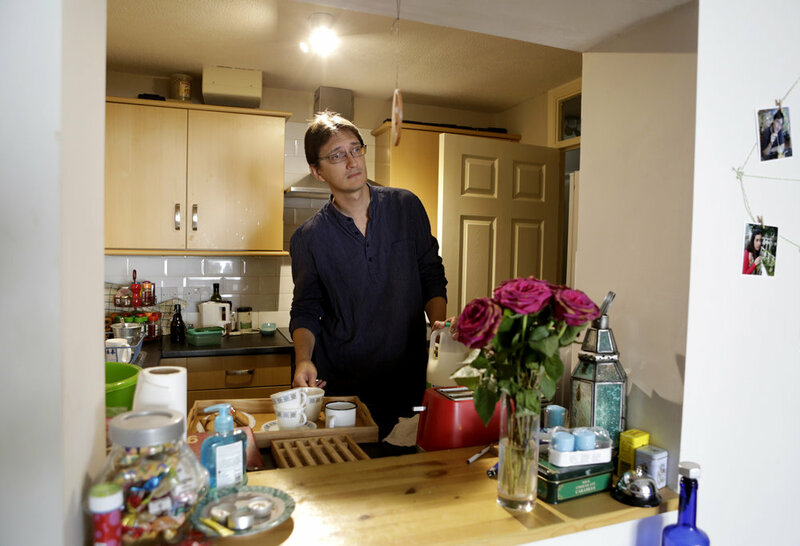 Michele, a special needs teacher from France, in her kitchen. Bolsover, October 2016. «I was very sad when it [Brexit] happened. For the first time in 20 years I felt like I wasn’t welcome. I have been working and paying my taxes, I am teaching difficult groups that nobody else wants to teach, it’s not like I am stealing work from anybody. Young British people are so open-minded and friendly, and so well educated. They are very accepting of other people’s differences, be it their nationality or their sexual identity. They embrace people of colour, the LGBT collective, and people with different religions or beliefs than their own. Michele arrived in the UK from the Vendée region of France in 1997 to take a position as a Language Assistant at a British university. She then started a Postgraduate Degree in Education. After completing her studies she worked in various schools across the East Midlands. Michele currently works in a special needs school, helping vulnerable children. Interviewed on October 13th, 2016. 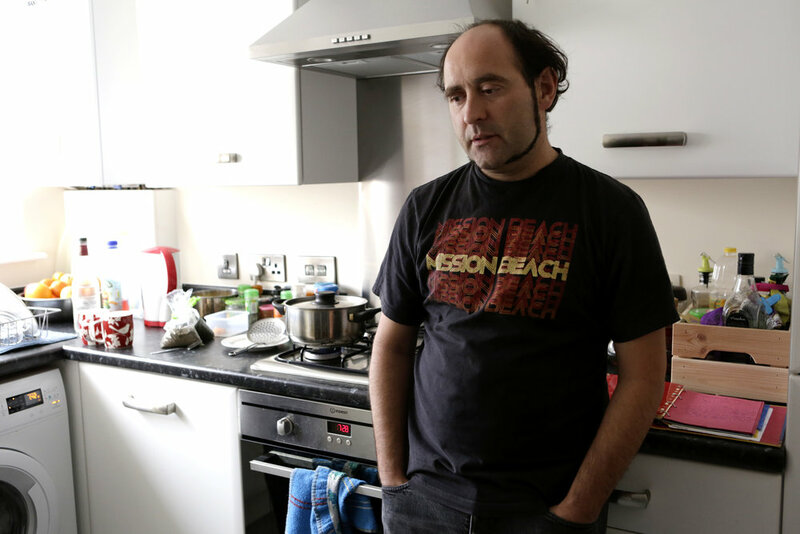 Simon, a University lecturer of Anglo-Spanish background, in the flat he shares with this Spanish girlfriend. Nottingham, September 2016. «The day after the referendum, was working at a theatre workshop in London with people from all over the world. We were all devastated. Then out came the stories in the press about people telling European waiters to go home. It was disgraceful. I grew up in Croydon, and whilst part of me considers it home, it is also an inhospitable dormitory town which I would hesitate to call my home when I compare it to Madrid. The referendum result has done nothing but drive this home to me. My difference has never been a positive thing to society in general, only to a few who appreciate difference, who are not blinkered. To me, Brexit feels like that all over again, a rejection of what is different, and the indifference of a vast proportion of the population to the increasingly xenophobic and fascist actions of this government suggest their complicity. Simon was born in the UK to an English father and a Spanish mother. Although British by birth, Simon identifies strongly with his Spanish side. He holds a Bachelor of Arts in English and Spanish from Oxford University and a PhD in Spanish Theatre from Queen Mary University of London. Simon has travelled between the two countries his whole life. In 2008 he moved to Spain and began working for a theatre company in Madrid. In 2013 he returned to the UK to work as a University lecturer, a position he still holds now. Interviewed on September 26th, 2016. Begoña, a Finance consultant from Spain with her daughter. Nottingham, January 2017. «I was surprised when l learnt the result of the referendum, neither of us were expecting it. We couldn’t believe it. At first I felt rejected, the society I have known for years has always been respectful and inclusive, and that appeared to have changed overnight. Later on I felt a lot of uncertainty, both for me and for my English friends who live in Europe, you begin to realise that this is going to affect a lot of people. I get the feeling that the UK was never fully involved in the EU, their heart just wasn’t in it. I think the result was partly due to do with lack of employment. When there is an economic recession people start thinking that others are taking their jobs away from them, when in fact a lot of immigrants who come here do the jobs that no one else wants to do. Begoña came to the UK from Spain 12 years ago to improve her command of English. She worked as a waitress and, thanks to her background in Economics, was soon able to find a position in the international finance sector. Begoña met the man she would eventually marry in the UK and gave birth to a baby daughter four years ago. Interviewed on January 16th, 2017. Gabriela, an office worker from Romania in the house she shares with her British husband Tim. Calverton, 2017. «My initial reaction [to the referendum result] was quite raw and quite strong. I remember saying to my husband ‘That’s it. I’m officially not welcome in this country. I no longer see the UK as a potential home. By the time I started feeling that I was setting down, Brexit happened and everything changed. Nowadays it feels more like a place of transit mainly because of all the uncertainty surrounding it. Even though quite a few people around me tell me that I shouldn't worry because I'm one of the "good" immigrants somehow it doesn't really make me feel better. Gabriela comes from Romania. She met Tim - an Englishman and now her husband - in the Czech Republic in 2012 when they were both working for the same company. After a couple of years they decided to move away. Gabriela is a Modern Languages graduate and has a PhD in Contemporary British Literature. She works as a team leader in the finance department of a global company. Interviewed on March 29th, 2017. 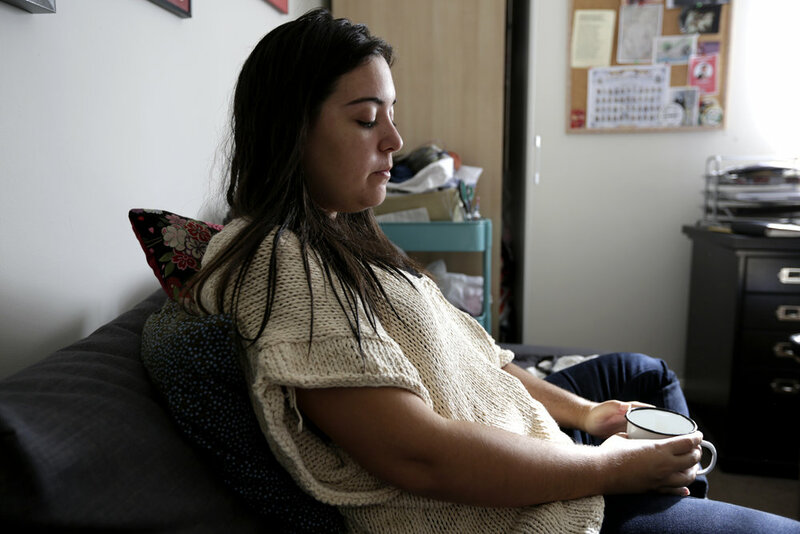 Maria, a Spanish University teacher, in the flat she shares with British partner Simon. Nottingham, 2016. «I experienced a lot of sadness and anxiety at the beginning. Brexit made me question whether this was really the place for me in the long term. I felt left out at a time when I was working hard to fit in and adapt to British culture. I think some people view us as second class citizens, just because we weren’t born in the UK, which I find unacceptable. In fairness, I have had a lot of support from some sectors of society, like work colleagues and my own students, which has made me feel a bit better. Maria came to the UK from Madrid in 2014. She is currently enrolled in a Masters Programme to further her skills as a language teacher. In the future, Maria would like to develop her own Spanish-teaching business, using her passion for cooking as a medium for teaching the language. Maria moved to Spain in 2017 to work as a teacher of English as a foreign language, this ended her relationship with her long-term British-Spanish partner (Simon in these series), who stayed in the UK. 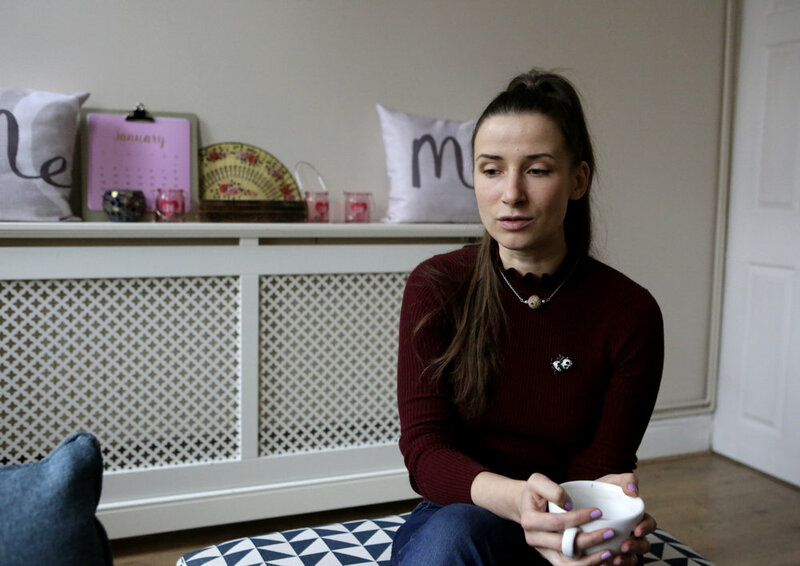 Rimante, a purchasing assistant from Lithuania, in her sitting room. Nottingham, 2017. «I was very surprised to hear the result of the referendum. Then all the negativity poured in, everyone around me seemed so distressed and negative about it. I felt confused because everyone who campaigned to get that result then disappeared and took no responsibility. I don’t think there was enough information in general, on either side, and the press just weren’t helping at all. I still don’t know what Brexit is all about. Is it just about leaving the European Union? Is it about getting rid of foreigners coming over? Is it about the country becoming independent? Personally I haven’t felt any bad effects, everyone at work was very supportive.. It’s important to remember that this is not just affecting EU nationals, it’s affecting a good number of British people and businesses as well. Rimante arrived in the UK from Lithuania in 2014 looking to further her education and find better opportunities for herself. She studied Multimedia at her local University for two years and then completed a course on alternative therapies. Rimante now works for the buying department of a builders’ merchant retailer. Interviewed on February 7th, 2017.